Sonoma Bento: Leave The Gun. Take The Cannelloni. A week ago when I went to play trivia at The Cantina in Santa Rosa, I won a really cool prize: a Godfather Gift Basket! It was filled with fun goodies like Francis Ford Coppola wine, crystal stemware, pasta, canned tomatoes, chorizo sausage, peppers, garlic, onion, and a copy of The Godfather Part 2! What a freakin cool prize. So this bento box lunch was inspired by that prize. I used the line from the first Godfather to create this bento box lunch. In the scene, Clemenza instructs Rocco, who has just shot and killed Paulie, to, "Leave the gun. Take the cannoli." Cannoli are italian desserts that are shaped like tubes and filled with whipped cream or other sweet stuff. The pasta that was in the basket of goodies was tube shaped, so I though I would try a play on the line, and switch it up to cannelloni (stuffed pasta shells). 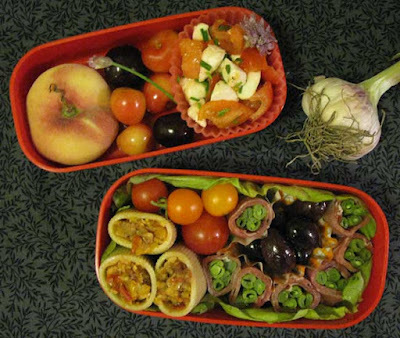 In this bento box: a "donut" peach, cherries from the Santa Rosa Original Certified Farmers Market, and a tomato salad made with fresh mozzarella cheese, chives and chive flowers, and tomatoes from Triple T Ranch. 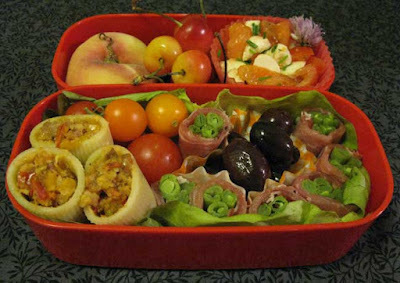 In the lower compartment: tomatoes, stuffed pasta shells, roasted green beans wrapped in proscuitto, and olives. 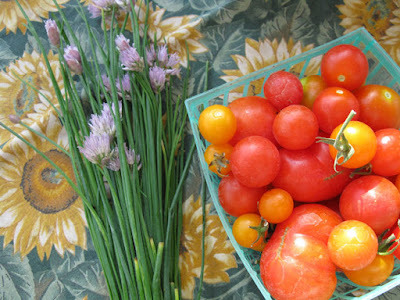 These are chives (and chive flowers), and a basket of the first tiny tomatoes of the season from Triple T Ranch. 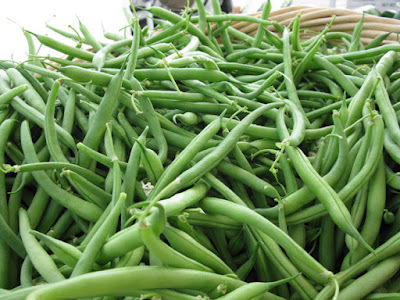 Check out this pile of delicious, tender green beans from Crescent Moon Farms. I roasted these in the oven with olive oil, salt, and pepper, then rolled them up in prosciutto. So easy and yummy! And I really recommend checking out the Quizmaniax Pub Quiz, currently held on Thursday evenings at The Cantina in Santa Rosa. Find out more about Quizmaniax on their Facebook page. The Italian bento--excellent! Gutsy, summery flavors, beautifully presented! I dream of living in the Sonoma area its beautiful land and produce! Love the chives and super fresh green beans, these photos make me think of a market in Provence and Tuscany...lucky you! Hi Jenn! I know, I am sooo lucky. The food here is ridiculously good. This bento was really tasty, the stuffed pasta turned out great, and the green beans were wonderful wrapped in proscuitto.